As per the report analyzed by TMR, the market is projected to expand at 8.0% of CAGR during the forecast period from 2016 to 2024. The valuation of the market was US$1.17 bn in 2015 that is expected to reach US$2.23 bn by the end of the forecast period. Based on end use, military forces segment holds the highest position as compared to the law enforcement agencies. As per regional analysis, Middle East and Africa are considered as the most lucrative markets followed by North America. Growing demand in Asia Pacific is gaining attraction from the market players. Anti-national bodies or dispute between growing various uncertainties in nations across globe to rise the demand for the market increases. In times of riots, regional insurgencies, and during natural or manmade disasters military use non-lethal biochemical weapons. These conditions increases the chances of unlimited growth of non-lethal biochemical weapon market. Growing vulnerabilities across nations have increased the defense budget across nation, which will prove beneficial for the market. Growing human assistance services for law enforcement is expected to boost the demand for non-lethal biochemical weapons market. Changing political scenarios in few regions also attributes to rise of the market. 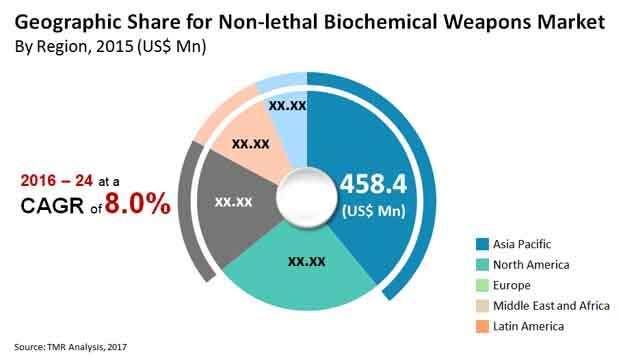 Political turmoil in countries such as Egypt, Syria, Israel, China, India, France and the U.S. have been responsible for the high demand for the non-lethal biochemical weapons market. In contrast, several factors have restricted the market from growing. Rising environmental concerns have attributed to obstruct the demand for non-lethal biochemical weapons market. Strict government regulations that denies the use of chemicals, as it will harm the humans on a larger extent, acts as a restrain for the market. Decreasing defense budget in advanced economies have resulted in hindering the growth of the market. In addition, trafficking and unselective use of non-lethal biochemical weapons also decreased the demand for the market. However, companies and stockholders linked to the value chain are making efforts through research and development activities that will help the market to grow. Companies are also tapping opportunities in the emerging economies that will accelerate the demand for non-lethal biochemical weapons market.